Walking pneumonia is considered to be contagious and is typically spread by coughing and sneezing. A person who has it can be contagious for as many as 10 days. There are a few things a person can do to help lower their chances of getting walking pneumonia. Frequently washing your hands with soap and water is always a good idea as is eating a balanced diet, and getting sufficient sleep every night. 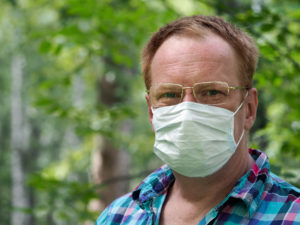 It is important to dress appropriately for inclement weather which can make you more susceptible to lowered resistance and to cover your mouth when you cough or sneeze and ask others around you to do the same. Not smoking will also help. Treating walking pneumonia requires drinking lots of fluids and getting as much rest as possible. Your doctor may prescribe an antibiotic if they feel it is necessary. Most people start to feel better after four or five days but there are some people who have a cough that can last for weeks. If you are experiencing symptoms of walking pneumonia, you should see your physician for appropriate treatment options. If you would like to schedule an appointment with a physician at Flushing Hospital Medical Center, please call 718-670-5486. This entry was posted in Pulmonary Medicine and tagged Flushing Hospital Medical Center, walking pneumonia by Andrew Rubin. Bookmark the permalink.